The whole family enjoys this podcast very much. The presenters have wonderfully calm, gentle approach to kids curiosity and science. Thank for the excellent and in depth stories. We watch for new episodes with much anticipation. Who makes the laws? That's what 5-year-old Paxton from Kelowna, British Columbia wants to know! We learn about laws with Mike Doyle of the Canadian organization Civix, and Syl Sobel, author of How the U.S. Government Works. We also answer a question from Charlotte in North Carolina: how do elections work? And Hattie in England asks why her country has a government and a queen. In this episode of But Why, we're answering your questions about...us! Why do you make But Why? How are podcasts made? And we're answering questions about the physics of sound and radio. What is sound and how is it made? Why are sound waves invisible? How do echoes work? How do microphones work? How do radio signals work? Answers to your sound and radio questions from our VPR colleagues: sound engineer Chris Albertine and Chief Technology Officer Joe Tymecki. We're exploring two different animals in today's episode. One has a long neck and the other has a long trunk! We'll answer: Why are elephants so big? How do their trunks work? Why do they have tusks? Why is elephant skin so rough? Do elephants stomp? Are they actually afraid of mice? And Why are elephants being poached? Peter Wrege of the Elephant Listening Project, which studies elephants in Central African Republic, answers elephant questions. And Steph Fennessy, from the Giraffe Conservation Foundation in Namibia, answers these questions about giraffes: Why do giraffes have long necks? Why do animals have different patterns, like zebras, giraffes, cheetah? What's a giraffe's usual life span? And why are their tongues purple? This week, instead of a normal episode, we're bringing you an episode from one of our podcast friends, Circle Round, from WBUR in Boston. Circle Round features folk tales from around the world, and we've selected one we think you'll really enjoy. French comedian Gad Elmaleh stars in "Armadillo's Song," a story about achieving goals and proving naysayers wrong! Why don't spiders stick to their own webs? How do spiders walk up walls and on ceilings without falling? Why do spiders have eight legs and eight eyes? How do they make webs? And silk? What's a cobweb? How do spiders eat? And why are daddy long legs called daddy long legs when they have to have a female to produce babies?! We're talking spiders today with arachnologist Catherine Scott. Kangaroos, Koalas, and Wombats! Why Don’t They Live In Cities? Why do turtles need shells? Why do turtles move so slowly? Why do frogs hop? Why are frogs green? Why are colorful frogs poisonous? Why do frogs inflate their throats? What some of the biggest threats are to amphibians and reptiles? We head out to the pond to get answers from some herpetologists! We also get a preview of the new Earth Rangers podcast! 'But Why' heads to the farm to answer a whole herd of animal questions: How do cows make milk? Why do cows moo? Why do some animals eat grass? Why do pigs have curly tails? Why do pigs have more teats than cows? Why do eggs in the fridge not hatch? How do chicks grow in their eggs? Why do roosters crow? Why do horses have hooves? Why do horses stand up when they sleep? Why are some fences electric? Why do ants bite? Do both male and female ants have stingers? Do ants sleep? What do they do in the winter? In this episode we learn all about the fascinating world of ants with Brian Fisher , curator of entomology at the California Academy of Sciences. Fisher has identified about 1000 different species of ants! How do owls eat? Why are owls nocturnal and how do they see in the dark? How do owls swivel their heads all the way around? Why do birds move their heads back and forth when they walk? This episode was recorded live at The Mega Awesome Super Huge Wicked Fun Podcast Playdate in Brookline, Massachusetts. How does your heart keep you alive? How does it pump blood? Why is blood so important? Why do children have heart surgeries? Why is a baby's heartbeat faster before it's born? Why does blood rush to your head when you're upside down? Why can you feel your heart in your head when you're lying still or under water? In this episode of But Why, we're going talking about a very special muscle! It keeps us alive and it has its own special rhythm: the heart. Pediatric oncologist Dr. Jane Crosson from Johns Hopkins Hospital answers questions about the heart. How did the first fish get into the ocean? How do fish breathe under water? If you put a fish's head underwater, but not its tail, would it survive? How do fish get diseases? How do fish see underwater without googles? Why do fish swim when they are asleep? Do fish drink water? Do fish have ears? How are fish born? But Why visits the New England Aquarium in Boston to get answers to those and other questions kids have sent us about fish. Why do we have daylight saving time? And why are days longer in summer and shorter in winter? Daylight saving time is really just a trick. At least, so says Michael Downing, author of Spring Forward: The Annual Madness of Daylight Saving Time. He's our guest in this episode and he explains the reasons behind this semi-annual ritual of moving the clocks forward and back. On this special episode of But Why, we're going to introduce you to some of our kids podcast classmates. We've all gotten together to create one big podcast episode that gives you a little flavor of what each one of us is all about. Enjoy! In the wake of the deadliest mass shooting in U.S. history in Las Vegas on Sunday, we're re-releasing our special episode for parents. We speak with Dr. Robin Gurwitch about how to answer questions children may have about violence they hear in the news. She's a child psychologist at the Duke University Medical Center and she has served on numerous commissions and committees about children and trauma, including the National Advisory Committee on Children and Disasters. How is glass made? Why does glass break? Why do bubbles pop? What's it like inside a bubble? We make everything clear in this episode! Our questions are from kids in Arizona, Brazil, California and Cambodia. We're answering ten questions as quickly as we can in this episode of But Why. Why do onions make you cry? How do hummingbirds hum? Why do flamingos stand on one leg? Do moths have veins in their wings? Do cats that share a home have the same meow? What was the first book? How do libraries get money if people borrow books for free? Why do people have fidget spinners? Why can't my stuffed animal get wet? And how do pigs poop? Can we do it all in 20 minutes?! In this episode we're celebrating the official return of summer to the northern hemisphere by answering some summertime questions! How do fireflies glow and can they control how they blink? Why are owls nocturnal? How do they swivel their heads around? And how do they hoot? Plus a few burning questions about why bug bites itch, why poison ivy and caterpillars and berries can all be poisonous, and how come we have to wear sunscreen! We'll get answers from wildlife biologists Kent McFarland and Bryan Pfeiffer. Plus we hear an episode of one of VPR's other podcasts, Outdoor Radio. Why are there so many plants? How are seeds made? How does germination work? How can plants grow so big if they start from such a small seed? Why are flowers different colors? Why are plants and trees green? Where does dirt come from? In this episode of But Why , we're talking about plants with garden consultant Charlie Nardozzi. The discovery of seven new planets that could contain life has kids and adults pretty excited. We can't get to these planets yet but we do have tools to explore planets closer to home. In this episode, St. Michael's College astronomy professor John O'Meara answers how the Mars rover is driven from back here on earth? On this special episode, we're going to listen to a story about how turkeys used to get from farms in Vermont to markets and dinner tables far away in Boston, a distance of a couple hundred miles. This was before refrigerated trucks. So how do you think they did it? Who invented the president? Which country had the first president? We answer presidential questions historical in nature with author Kenneth C. Davis . Also in the episode: why do leaves change color in the fall? Why Is Soccer Called 'Soccer' Instead Of 'Football'? Why Don't Bicycles Fall Over? It's all about bikes in this episode of But Why? Why bicycles can stay up when you're riding them, but fall over when stopped. Olympian Lea Davison tells how to get started when riding, and we learn how a bike chain moves a wheel. Seven-year old Sawyer wants to know: how does an engine work? We learn about chainsaws from Ashleigh Belrose, an instructor the Center for Technology in Essex, Vermont. How Does It Feel When Your Family Changes? Families grow and change. What does that feel like? We asked kids to tell us about their families, and we speak with author Amy Bloom about how love is not something that needs to be divided up, like a pie, but can expand and multiply. Special Episode: How Do You Talk To Kids About Violence In The News? This is a special episode just for parents. It's about how to address violence and tragedy in the news with your children. This podcast comes the day after and in response to the mass shooting in Orlando, Florida. In this episode of But Why we're learning how to make paint from an artist who wild-crafts his own pigments, and we're visiting the Isabella Stewart Gardner Museum to learn about the value of art. Why Do People Have Different Religions? In this episode of But Why we tackle the question of why people have different religions. Our answer comes from Wendy Thomas Russell, who wrote a book on how to talk about religion for secular families. Plus we visit a farm where kids of both the human and the goat variety are involved in making cheese. On But Why we let you ask the questions and we help find the answers. One of the things that many of you are curious about is language. How we speak, why we speak and what we speak. We're turning things around! Instead of you sending us the question, this time we're asking the question and looking to you for some answers. We wanted to explore why music moves us. What Is The End Of The World Going To Feel Like? This episode looks at a big question, a really big question. It's about the end of the world and what it might feel like. Parents: this episode is about asteroids and supernovas; some kids may find this episode a bit scary, or may have never considered those possibilities before, so you may want to listen first on your own. How Do Bears Sleep All Winter? In our very first episode, we've got owls and turtles and bears, oh my! It's all about animals. 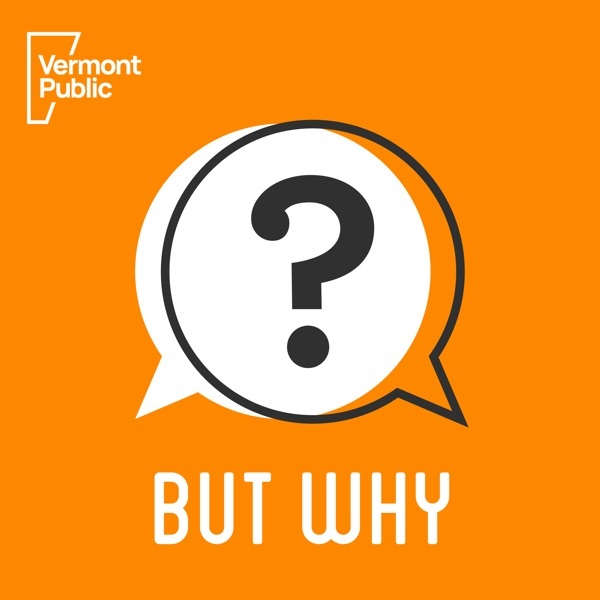 My name is Jane Lindholm and I'm hosting a new podcast for kids from Vermont Public Radio.